U.S. 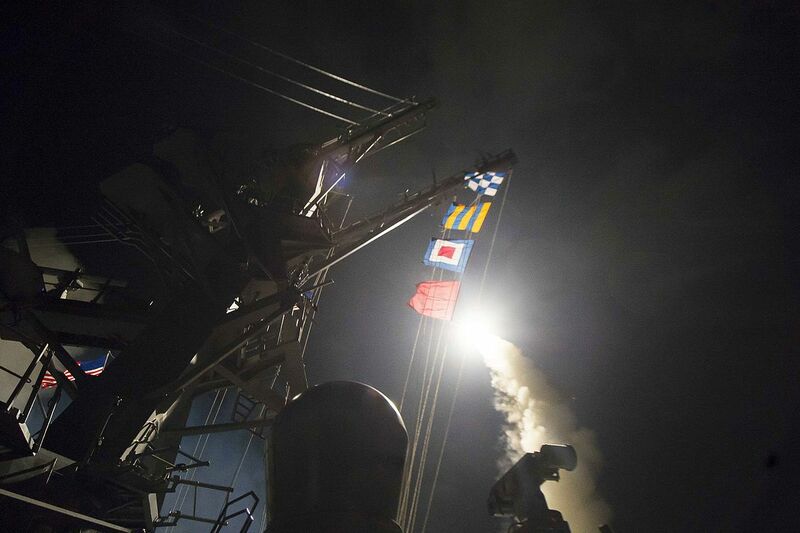 Attacks Syria: No Support for Trump or Assad! For Workers’ Unity! Donald Trump seized this moment to order a military strike on a Syrian airbase on Thursday night proclaiming “It is in this vital national security interest of the United States to prevent and deter the spread and use of deadly chemical weapons.” There is no doubt that the Assad regime is a vicious dictatorship responsible for countless atrocities against ordinary people in Syria, including use of chemical weapons, although questions have been raised about their responsibility for Sarin gas in the Idlib attack. But Trump’s response reeks of hypocrisy when his administration is also at this moment ramping up a bombing campaign against ISIS in Syria and Iraq, leading to increasing civilian casualties including hundreds in one strike alone in Mosul. U.S. imperialism has also been supporting Saudi Arabia in its brutal campaign in Yemen against Houthi rebels which is leading to massive casualties, a collapsing economy and potential mass starvation. Trump’s attack on Syria takes place at the same time he has acted to prevent any refugees fleeing the war-torn country from coming to the U.S.
Socialist Alternative opposes the endless U.S. military interventions in the Middle East which are the main source of the massive crisis facing the people of Iraq, Syria and the region, from the Persian Gulf War to the 2003 invasion of Iraq, and long before. Together with the Committee for a Workers International (CWI), with which Socialist Alternative is in political solidarity, we supported the Arab Spring and mass uprising against the Assad regime in 2011 but explained that the intervention of foreign powers in Syria then helped turn the situation into a communal civil war. Saudi Arabia, Turkey, and the U.S. have backed various anti-Assad forces while Iran and Russia have supported the regime. Trump’s action could be a “one-off,” but it could also be the beginning of deeper U.S. involvement in the Syrian conflict which will in no way help the suffering people. It may also lead to an extremely dangerous and unpredictable standoff with Putin’s Russia, Assad’s main backer, which has a major military presence in Syria. Trump’s military attack was immediately backed up by key leaders in the Republican and Democratic Party. Senate minority leader Chuck Schumer called it “right thing to do.” Hillary Clinton declared on Thursday that she favored completely destroying Syria’s air bases. This shows that the ruling class and the political establishment will rally behind an imperialist presidency and the assertion of American power even when the individual holding the office is the dangerous and unstable Donald Trump. They could not care less about the Syrian people, but they are very happy to see a shift away from “America first” isolationism which Trump proclaimed during his election campaign, including his (then) explicit opposition to deeper involvement in the Middle East conflicts beyond fighting ISIS. While Trump claims that he was moved by the horrible images from Idlib, it is clear that the main purpose of this attack was to distract from his plummeting poll numbers and domestic troubles including the rejection of the Muslim ban by the courts after mass protests and more recently the failure to pass Trumpcare. While the Senate managed to get Trump’s Supreme Court nominee Gorsuch through, key parts of his agenda are in danger because of mass opposition and deep divisions in the Republican Party. Trump may also be using this as an opportunity to demonstrate that he will take on Russia, given the Congressional investigations into Russia’s alleged interference in last year’s presidential election on Trump’s behalf and the ties between Trump associates and the Putin regime. Trump’s shift is also illustrated by removing Bannon from the National Security Council and his giving the generals freer rein to carry out attacks in the Middle East. Capitalism and imperialism have created the all-sided disaster facing the people of Syria. The working class and youth of the Middle East, the U.S., and all over the world need to build a mass anti-war movement and develop powerful working class parties, with bold socialist policies, to counter the war, terror and poverty of this brutal system. Next articleWhat Would a Socialist Food Industry Look Like?